Width : 12.00" Width : 11.75" Width : 11.50" Width : 11.25" Width : 11.00" Width : 10.75" Width : 10.50" Width : 10.25" Width : 10.00" Width : 9.75" Width : 9.50" Width : 9.25" Width : 9.00" Width : 8.75" Width : 8.50" Width : 8.25"
Please select the maximum pedal or device height that attaches to the base of your pedalboard. Ships by UPS only. Please choose UPS during checkout. A one-time price of $211.00 will be added to your order. Length: Choose the exact length of your pedalboard, measured from left to right in inches. The case will be made to fit a pedalboard of this length. Width: Choose the exact width of your pedalboard, measured from front to back in inches. 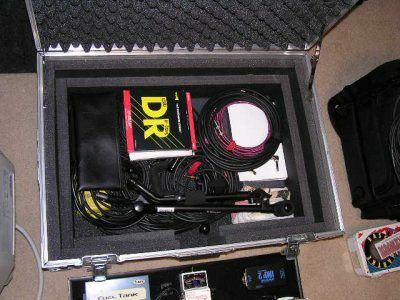 The case will be made to fit a pedalboard of this width. Height: Choose the height of your tallest pedal or device. The tip of the tallest point that will be mounted on your pedalboard including the height of a 2nd level riser or tier. Custom Sizes: The online order form above has provisions for selecting a custom size to suit your needs. Both the length and width of your custom size must be less than or equal to the original base size listed at the top of this page. You may need to select a smaller or larger base size to order the custom size you need. If you need further customization, please contact us. 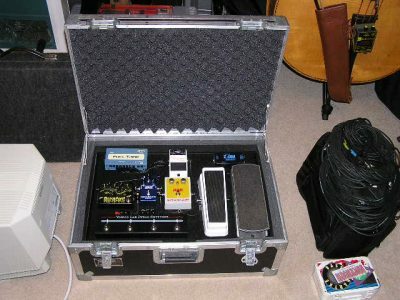 Pedalboard as the lid, over compartment. No compartment: This option keeps your case as slim and light as possible. These streamlined cases will have surface mounted handles. We use recessed handles by default whenever they will fit on every case however recessed handle will not physically fit with this option. If you are flying with this, you can still get recessed latches. Recessed latches are what’s important when used for air transport. 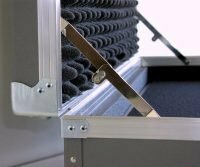 Accessory Compartment: This option offers an accessory compartment below the pedal board to store other gear. The bottom of your pedal board will act as the lid for this compartment. Both the length and width of your compartment will be 2″ smaller than your pedal board. You may select any interior depth for your accessory compartment. The exterior height of the case will increase by the amount of your compartment depth. 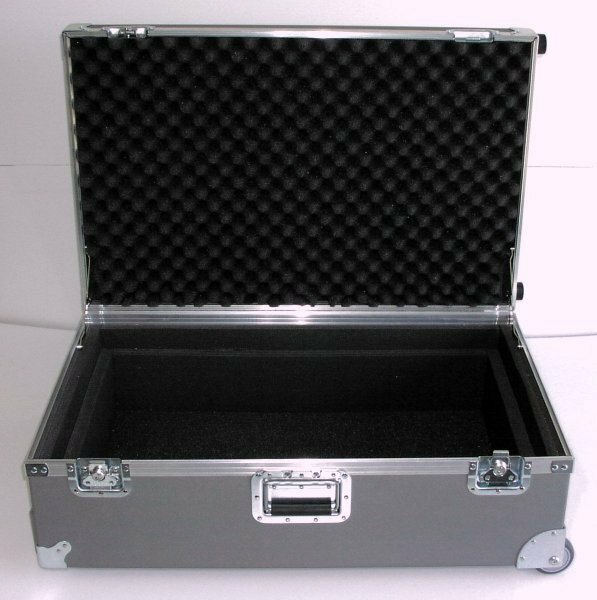 Cases with accessory compartment depths of 1.5″ or greater will be able to fit the recessed handles. Cases slimmer than that will have surface mounted handles as recessed handles will not physically fit. We use recessed handles by default wherever they will fit. Tilt wheels: Around town or around the world, going places will never be easier if you add some wheels. Think of your back! Rugged 3″ Tilt-Wheels are engineered into the case structure. Pushing or pulling your case glides you through the airport or alley with ease. You’ll be glad you added this great feature. 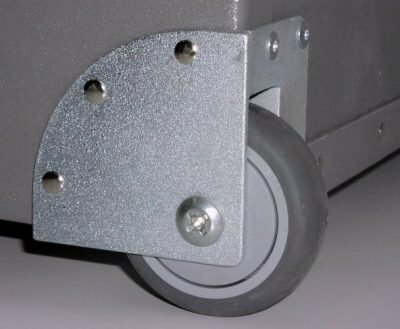 Tilt-wheels will add about 3″ to the overall length of a standard case without the accessory compartment option and about 2″ overall to a case with the accessory compartment. The overall height is also raised about 1″ by the wheels and bumpers. A standard handle will be installed opposite the wheels. If you have the accessory compartment option, the standard handle will be installed lower on that deeper case design for ease while using the tilt-wheels. If your pedalboard is less than 32″, you’ll need to have an Extension Handle below. Get rolling with a set of wheels on your case… and save your back in the process. Extension handle: If needed, the chrome-plated steel Extension Handle pulls out and locks into place for easy transporting and slides back inside the case when not in use. 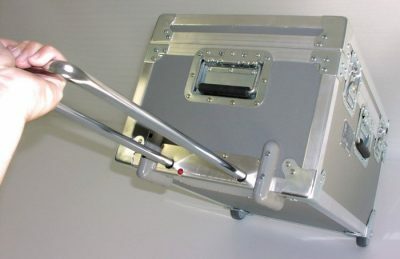 Cases for pedal boards less than 32″ will need the extension handle with the tilt wheels. The extension handle is optional for pedalboards 32″ to 35″ but you typically do not need it for moving it relatively short distances when the standard handle will do the job nicely. You might consider it if you walk long distances with that pedal board length and want to assure some extra leg clearance. 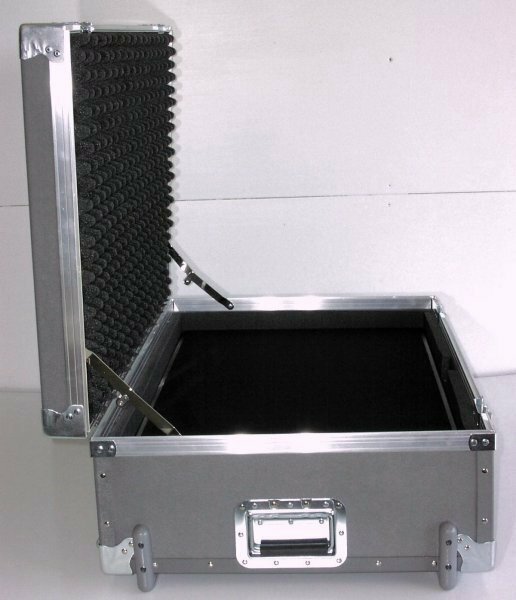 We do not recommend it for any cases with pedal boards over 35″ as those cases are long enough to use a regular handle nicely. 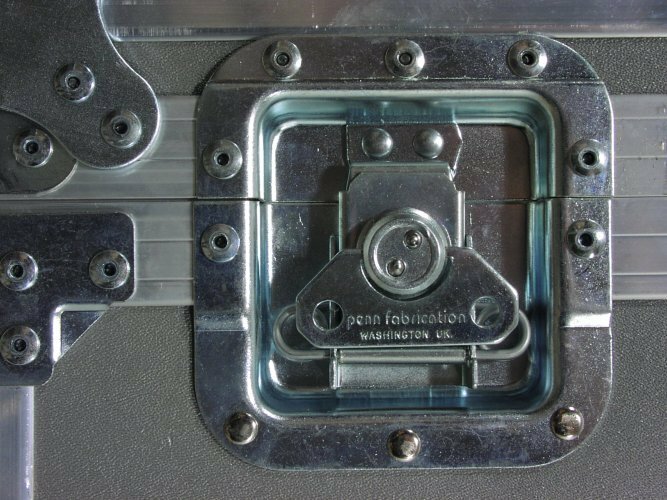 Keep in mind, the extension handle, if needed or desired, will increase the case an additional 1″ in height due to the space required for the extension handle area. Get rollin’ with wheels on your case… and save your back in the process! 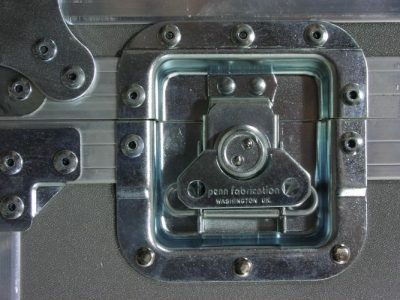 Surface: Key-lock draw type latches (top). Locking Recessed: Recessed key-lock latches features barrel type keys (bottom). We can install either 1 or 2 locking recessed twist type latches. 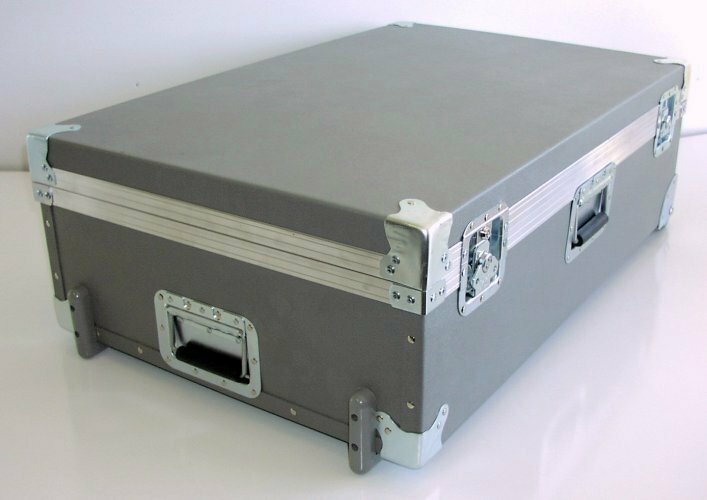 Smaller cases, especially for pedalboards less than 24″ long, may get by with only one lockable latch. 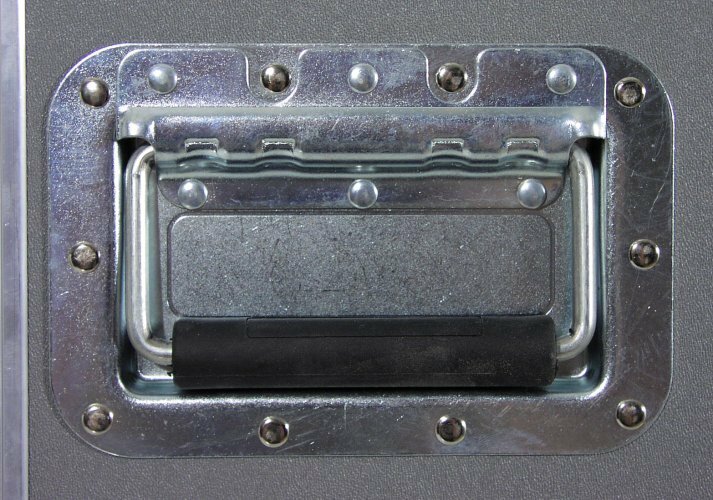 If your pedalboard is greater than 30″ or if you want maximum security, we recommend a 2 lock pair. 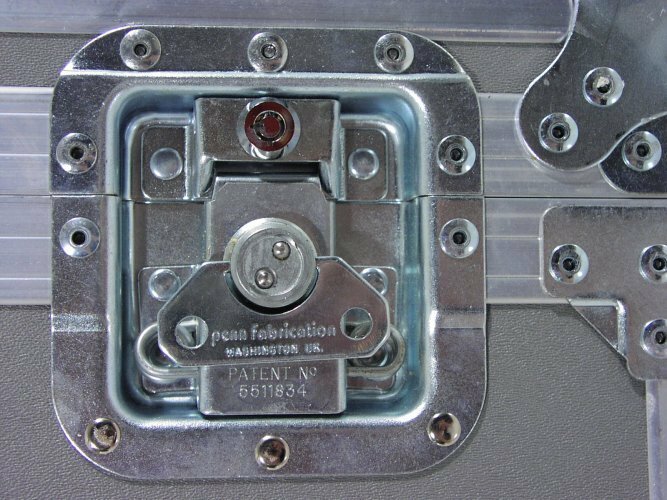 Some longer cases have 3 recessed latches as standard. When ordering only 1 lock on these cases, we would install the single locking latch near the center handle. Dura-Light cases are available in gray or black. Most of the pictures show the gray color. As your case gets used and abused over time, gray does a nice job of concealing the cosmetic wear and tear of the road. 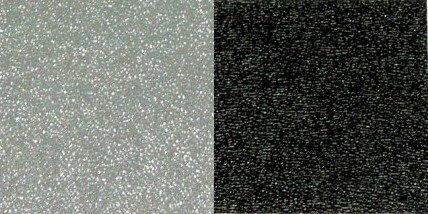 Black is a popular stage color but the gray is a nice distinctive alternative. Both make equally great cases. 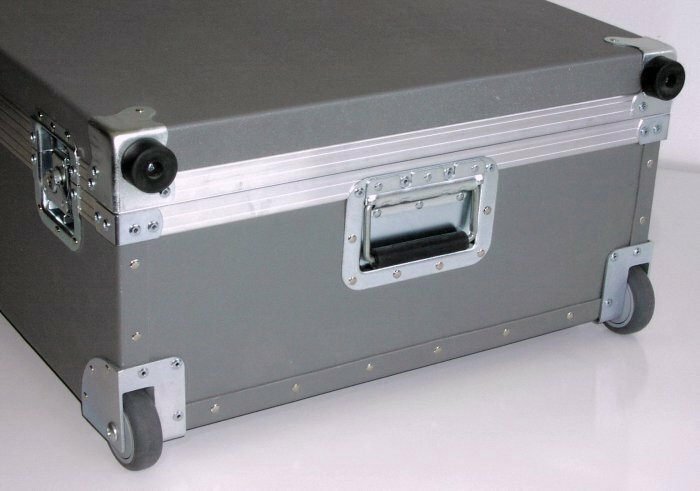 Dura-Light touring cases are made of tough, .103″ ABS plastic (superior to HDPE and other plastics) thermoformed to shape without wood. While extremely rugged and durable, they are much lighter in weight than many other cases. About 1/3 lighter than our heavy duty flight cases. 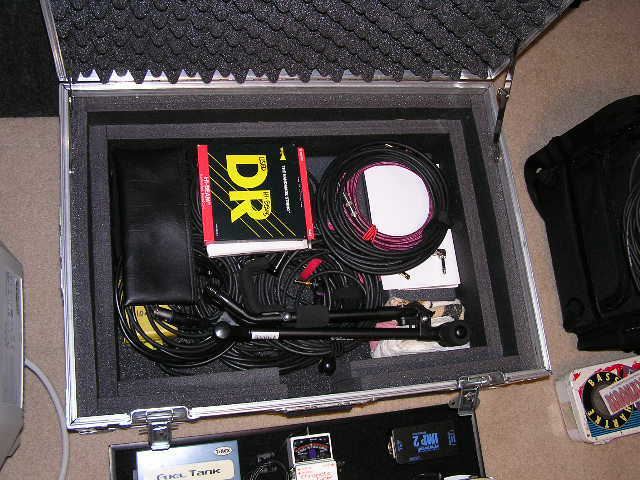 They also feature many of the same hardware components as our heavy duty flight cases. Dura-Light cases are especially suited for hand carrying and transit under most normal conditions and air travel when you order the recessed latch option. 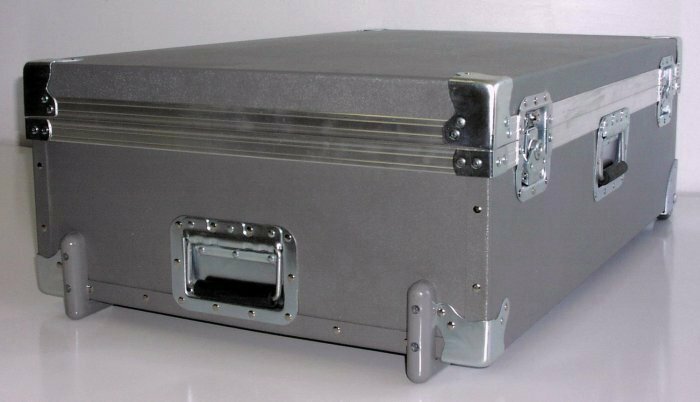 This case features recessed key lock latches, tilt wheels and an accessory compartment. This case has a 5″ deep compartment so the case is 5″ taller than one without the compartment. This case is just long enough to not need the extension handle for the wheels. We mount a regular handle as low as possible when there is not an extension handle on a case with tilt wheels. High impact .103″ ABS thermoformed body (Acrylonitrile Butadiene Styrene). Dust proof, extruded aluminum double interlocking tongue and groove valance. Stamped, nickel-plated steel corner protection. 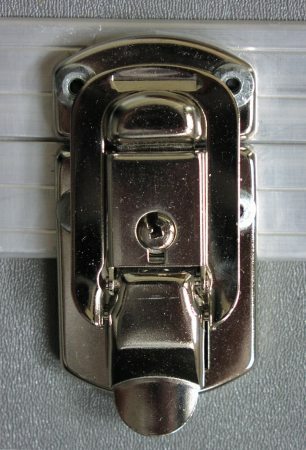 Nickel-plated locking steel draw latches. Two nickel-plated steel collapsible lid stays. Shock absorbing foam interior with thick and deeply convoluted foam in the lids. Exterior – Approximate size: L x W are 3″ greater than pedalboard. 6-1/4″ height. Optional Key lock Recessed Latches. Optional Tilt-Wheels system and Extension Handle. Open and empty 32″ x 20″ DuraLight case with accessory compartment. 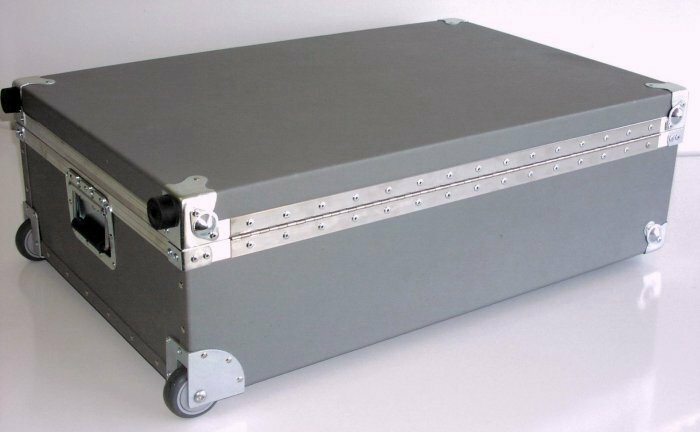 32″ x 20″ DuraLight case with 5″ deep accessory compartment, tilt wheels and 2 key-lock recessed latches. 32″ x 20″ DuraLight case with Recessed Latches and Tilt-Wheels. 32″ x 16″ DuraLight case in black with optional recessed latches. Thin cases like this require a smaller handle. Recessed spring loaded handles are installed whenever they will physically fit. Continuous piano type hinge made of heavy gauge metal. 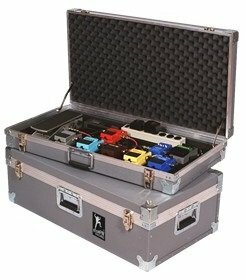 How much will my pedalboard system weigh? All itemized net weights listed here are in approximate US pounds and are for reference to help calculate your total weight. You will need to add the weight of all remaining items you will transport. • Size is your pedalboard size in inches. • Pedal board is the weight of our single level low profile model without any effect. Just an empty pedalboard for your reference. • Cases are listed without any options. Case weights are listed with two numbers to compare a DuraLight case versus a Heavy Duty case, “DL : HD”. • Add 5″ height is listed to show approximately how much the weight increases when 5″ of height or depth is added to the case such as when ordering an accessory compartment option or extra overhead height options. The added height is also listed with two numbers to compare the added weight for DuraLight case and Heavy Duty case options, “DL : HD”. Tilt-Wheels add about 3.5 lbs. Tilt-Wheels with the extension handle add about 6 to 8 lbs depending if it’s a smaller or larger case size. Recessed latch upgrade on Dura-light cases add about 1 lb.